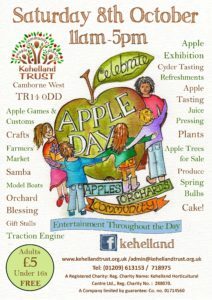 Bookings for trade stands are now closed and we are busy preparing the site in readiness for Apple Day on 8th October. 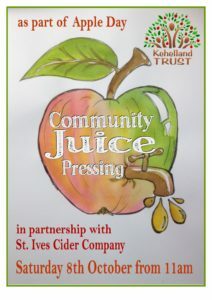 We are excited to announce that St. Ives Cider will be coming to our day with their Hydro-press to do Community Apple Juice pressing. 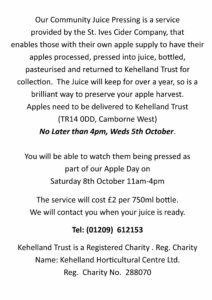 If you have apples you would like to bring to be pressed, you can bring them to Kehelland NO LATER THAN WEDNESDAY 5th OCTOBER. We will weigh them, St. Ives Cider will wash, process and press them, take them away bottle and pasteurise them. You can then return to Kehelland Trust for your juice @ £2 per 750ml bottle, labelled as Kehelland Juice (RRP £3.75). Apple Tree Sales – trees specifically chosen for a) having a history in Cornwall or b) Liking Cornwall’s weather! Apart from the good old Bramley, which is always asked for, but isn’t always that happy in our Cornish Climate! Our shop will be open selling a wide range of seasonal plants and produce. with staff on site to help with any questions you may have. Duchy College, Rosewarne’s Orchard Expert Andrew Gunderson; on hand to help with any tree or orchard enquiries. 11am – Celtic Fiddlers – Unique Traditional English, Irish, Scottish Folk in an orchestral setting! Throughout the day – Hotch Potch Productions http://hotchpotchperformance.co.uk/ ‘Tiny Tours’ 12pm and 3.30pm, plus circus skills for all to try. RJ’s – Pork & Apple Sausages (with Kehelland Apples), bacon and pork rolls with (yes, you’ve guessed it) Kehelland Apple Sauce. Delicious Wishes vintage ice-cream van serving Cornish Whippy, Roskilly’s ice-cream and more. 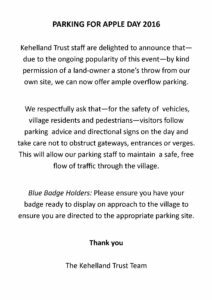 There will be all sorts of unannounced activity across the site, with lots of craft activities for families, apple games and customs and more. We hope to see you on 8th October! Please take note of our Traffic Notice on the reverse of the flier. We want to continue to let our Apple Day GROW! Many thanks. Will the Apple Day events include ‘recognition’ – we have moved into our house and have an apple tree – but cannot identify what sort of Apple it is – the apples are medium size, quite tart and green skinned when ripe.